This is an in-depth look at the M4 Sherman tank. 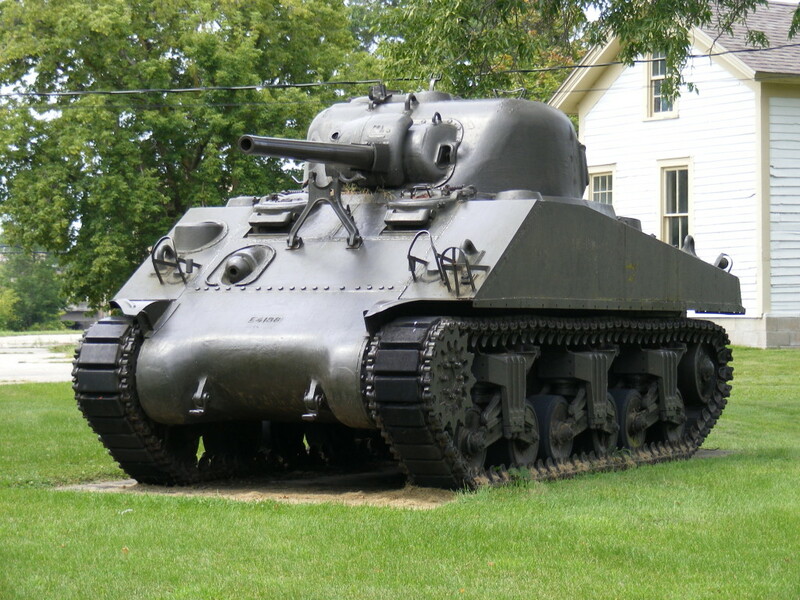 The original propose of this article was to take a look into the history of the M4 Sherman tank located in Tomahawk, WI. However, after researching and contacting the Tomahawk Historical Society there appears to be no records kept on this tank. It’s unclear even if this tank saw action. With this realization, the focus now shifts to the overall function and use of the M4 Sherman tank. Though the original inspiration stems from tank resting in Tomahawk WI. The M4 Sherman tank was originally named after The Civil War general, William T. Sherman. Replacing the M3 Lee, it was first put into service in World War II on September 2 1941, and became the most commonly used tank for the Allies. It was relatively easy to repair, easy to drive, and quick to construct using standardized parts. To put things into perspective, a total of just under 50,000 M4 Shermans rolled off of the assembly line, whereas the Germans only manufactured roughly 1,300 of their famous Tigers. The only tank that rivals the Sherman in sheer numbers was the Soviet T -34. 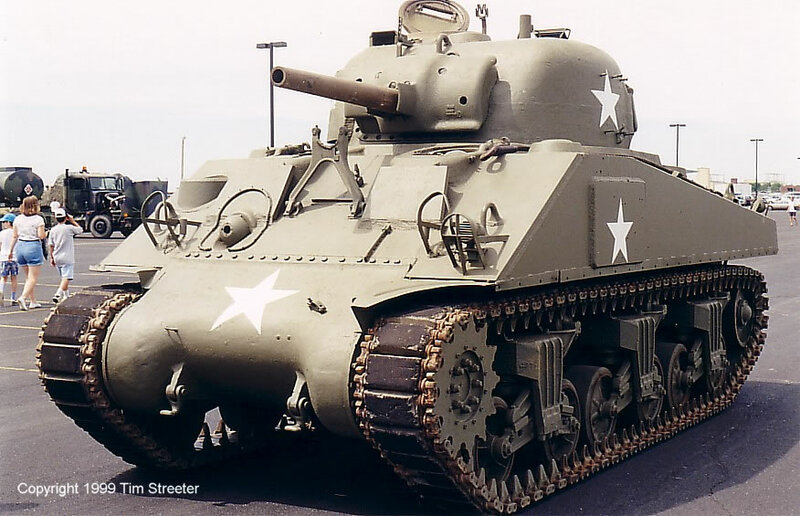 The Sherman was the all-around tank in World War II: it was decently armored, relatively fast, and could hold its own in the firepower department. It was such a success that after World War II the Sherman saw combat in Korea, and even after it was replaced by the M48 Patton as the United States’ main tank, the M4 Sherman was still in service for the US and its allies until the 1970s. The M4 Sherman is a general term for the “base” model with many different varieties of it made. Each variant differs on time put into service, location of service, and the manufacturer. This is probably first the most important features: the M4 had versatility. Originally designed from the M3 Lee to cut production time and cost, the M4 was designed in a way to remain roughly the same weight as the M3 but repositioned key features. The Sherman used a gasoline engine, unlike other tanks of the time (with the exception of the M4A6 and M4A2) that ran on diesel. Compared to a diesel engine, gasoline is very unstable. As the Sherman became more widely used, a key fault showed in this design choice. With the combination of gas and live ammunition if an M4 took a direct hit, they had a bad tendency to catch fire. Due to this the Sherman was nicknamed things like the “Tommycooker”, “Ronson”, and “The Burning Grave”. This is where the M4 Sherman started to lose its acclaimed “grand tank of the age” title. The M4 was designed to be quick (averaging a top speed of 25-30 mph), easy to transport; and versatile. As the M4 Sherman was put into wide use the crews manning them soon realized what they were driving into battle was out-classed by almost all other tanks of its age. The advantages that Patton himself had approved were now its downfall. Most were outfitted with a 75 mm gun that fired high explosive rounds at roughly 2000 fps, which sounds quite impressive[3,6]. But when compared to the German tanks with longer barreled guns which fired solid shot at 3500 fps the result is evident. This meant the German tanks had two to three times the penetrating power of Sherman. Out gunned and with mere 2.5in thick armor, Shermans were shredded by the dozens. The only saving grace was that the US kept shipping them over, though that didn’t solve the problems voiced by the crew members who were lucky enough to survive a Tommycooker[2,4]. Taking things into their own hands and tired of being sent in with tanks that had patched-over holes from German Tigers, crews starting outfitting their Sherman in some very odd ways that were not standard issue. 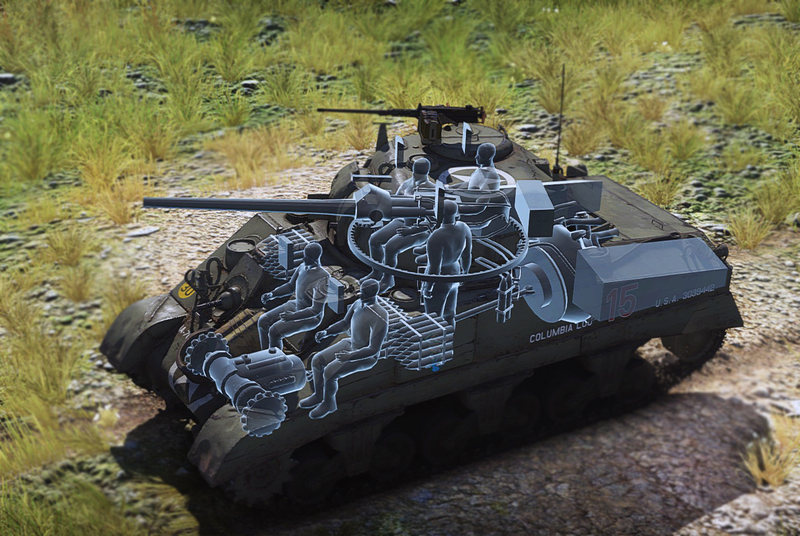 Crews of the M4 started strapping pretty much anything to the fronts and sides of their tank to help lower the odds of a shell breaking the hull and becoming a very unwelcome guest. Common things used were sand bags and logs, but some would even go so far as putting crumpled chicken wire on the front plate and then filling it in with cement. These men were quite desperate, which is understandable when you consider that they drove a tank that had to get within roughly 600 meters of a Tiger to be effective. That’s not a radius around the Tiger—a Sherman could not penetrate the Tiger’s front or side armor. Instead that’s 600 meters from the rear flank. A Tiger could put a shell through the front plate (head on) of an M4 at 2,000 meters. It would take a half dozen Shermans to take down a Tiger in a head-on confrontation. four or five to distract the Tiger’s turret, while the sixth one hit it from behind. A confrontation like this would probably put 4 of the M4s out of service or in need of repair if they could be fixed at all. The movie “Fury,” starring Brad Pitt, is a prime example though this if with the obvious added Hollywood flair. In the movie, four M4 Shermans, led by tank commander Brad Pitt, are crossing a field when a Tiger ambushes them. This scene is ripe with Hollywood inaccuracy except for the fact that the Tiger is able to drop three of the four Shermans in a single shot, before the one that happened to have Brad Pitt in it managed to flank the Tiger. The fact that the tank immediately caught fire is true as well; it’s the reason they got the nickname “Ronson”—it always lights on the first hit, the like the cigarette lighters made by that company[2,4]. The M4 Sherman took five men to operate. There was a driver, located front left where the driver of a normal automotive would sit. The driver’s job used to levers or “sticks” to control the left and right trends to propel the tank. Unable to see very much through his primitive viewport, the driver usually relied on the tank commander to give a more reliable description of the surrounding area. To the driver’s right sat the bow gunner with a 30mm machine gun to repel infantry from the front. Located in the turret were the commander, gunner, and loader. The loader was tasked with loading the 75mm after every shot. On average, the reload rate for a Sherman was 10 rounds a minute, at least when the loader was pulling the shells from the turret. If he had to pull from the racks elsewhere, the reload rate dropped to 1-2 rounds a minute. This meant if the Sherman was put into a situation where there was prolonged firing the loading rate would drop, encouraging the gunner not to miss. The gunner sat in the center of the turret with the 75mm gun just off his left shoulder. His job to hit the target was definitely not easy. Many would hit their targets, but the sinking feeling of watching shell after shell bounce off the German tanks was enough to crush anyone’s hopes. Yet on they pushed. The last position, the tank commander, sat just beneath the top hatch to the turret. His duty was to coordinate his crew to function as a unit and to keep his crew alive, a difficult challenge. The tank commander would also call out targets for the gunner, instruct the driver, and communicate with other tanks[3,6]. Room within these tanks, like most tanks, was a myth. With the entire tank buttoned up (all hatches closed and locked) and moving at top speed you couldn’t hear yourself scream. To put this all into perspective, all the flaws and perks of the M4 Sherman tank, imagine this: it’s 1940- something, you spent the last 10 months training in the western US with four other guys. You laughed with these guys and fought with them. You don’t particularly like Tony the driver, but no one really liked him and it didn’t matter—he was just one hell of a tank driver. You were told this was the top tier when it came to advanced tanks. Then your crew is sent to Britain to do another 10 months of training in preparation for the invasion. The invasion is a success; a couple months pass. News reaches your dusty tank that your son has taken his first steps; Tony’s brother is newly married; and that you are moving out to France. The landing is the easy part as your tank rolls up the beach you hold a sense of invincibility. You’re in a Sherman—bring it on Germans! The line of Shermans, seven in length and yours being the fifth, are tasked to push up the road. It happens without warning. You’re simply sitting at the hatch watching the upcoming hedge. A flash and flame, the sound of the turret on the Sherman ahead of you shooting skyward is lost. There is confusion as the crew is burnt alive. The second shot drops the lead tank. Orders fly and Tony is already guiding the tank off the road when the third shot tears through the hull. A glance down and Tony and the rest of the crew are replaced by flames. “Get out” is an all-consuming thought off the turret down the tank in time to feel a fiery explosion at your back. And away you run far and fast. No one saw the Tiger that day but six Shermans felt it. Two days later you’re sitting in a hatch, same road… different tank… different driver… his name was Steve. This is a rendition of what it was like to crew an M4 Sherman tank. Its most redeeming feature was there was another Sherman rolling off the line to replace the one the Germans shredded. MARK MAKARA, PUBLISHED: SEPTEMBER 29, 2014 – Teenage tanker: From D-Day to VE Day, one armor soldier’s WWII combat experience. History Channel. (2016) ‘Deconstructing History: Sherman Tank and World War II Tanks. World War II History. History Channel (1/26/2016) “M4 Sherman Tank” – Crew tell how shocking it was. Belton Y. Cooper, Published April 29th 2003 by Presidio Press (first published 1998) Death Traps: The Survival of an American Armored Division in World War II.